Hey, this is the first Harry Potter book I got to read before my sister. Now I suppose there are a few things you might need to know before you read this review. 1) I saw the first movie before I ever read a book. To me Snape was Alan Rickman and Draco was the adorable little moppet Tom Felton, and I couldn't bring myself to hate either one of them from that moment on. 2) I love Jason Isaacs, the actor who plays Lucius Malfoy, so much that I was cheering for him to win in The Patriot. 3) I don't really enjoy the books. I dunno, maybe I'm some kind of freak or something. I mean, I'm totally for something that gets kids interested in reading, but I find them a bit childish. Why would a Death Eater, even one undercover as a teacher (book 4), attack the son of another Death Eater? Why would very close-minded pure-bloods, who want nothing but to keep the magic world "pure", follow half-blood Voldemort? None of it makes any sense to me. Then book 6 lands on my desk. I start reading it with some pretty low expectations, so no one was more surprised than myself when I actually liked it. I don't know why I liked it; there was still so many of the elements that made me hate the first five books. One thing I especially hate about books like this is that the bad guys are always arguing amongst themselves. When I read, or watch TV or movies, I need a good villain to hate, or fear, or grudgingly admire for his brilliantly nefarious scheming. Good, interesting, compelling villains need to follow all of Peter's Evil Overlord Rules, need to be organized, with followers who are loyal to him and each other. If not, it's like watching a bad Saturday morning cartoon. It's absolutely no fun reading/watching a hero defeat a crappy villain. Most of the characters that we're supposed to love, I either find annoying - Ron, Mr. Wesley - insufferable - Ginny, Mrs. Wesley, Hermione - or just plain vile - Harry. They don't get any better this time round. And I'm just never going to be able to forgive Lupin or Sirius for their bullying of Snape; childhood bullies do not deserve to be let off the hook. There's also a lot of pointless pairing off in this book, and a lot of page space is wasted on the characters romantic entanglements. There's also one really funny typo (or unfunny joke) on page 454, when a character refers to Ron as Rupert, the name of the actor who plays him in the movies. Note to editors: please check for errors like this! I really only read these books for Draco, Lucius and Snape. When I first started reading this book and saw that Narcissa Malfoy was mentioned a lot in the second chapter, I sort of cringed. I was afraid she was going to turn out exactly how so many fanfiction writers write her: a woman with a good heart, trapped by an unloving, cold Lucius, while she tries desperately to break away from the Dark Lord. Give me a break! What's so wrong with a villain every now and then (in a purely fictional context). Villains are the backbone on which most stories rest. We didn't get as much of Narcissa as I'd thought, so I'll hold out judgment on her characterization until the next book. But, even with everything I've said, there were parts of this book I really enjoyed. 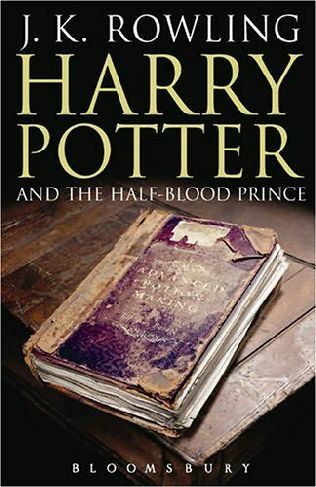 Draco's more than a childish, mindless bully in this book, with an actual subplot that's not just menacing the trio of heroes. The author again invites us to ask the question, is Snape really good, or really evil? We get a lot of Voldemort back-story, seeing him at different parts of his life. This was definitely the best part of the whole book - except for the ending. And hey, we finally get that all important question answered. Blaise Zambini: MALE. Ruby's Rant: Why did Coral make me read this book? I stopped liking the Harry Potter series after the third one. Or was it when the movies started popping up? Whatever. But I did find out something very important, I now know WHY I hate the books so much. It is the Ministry of Magic! They're exactly the same as the Watchers Council in Buffy, their sole purpose is not to help wizards (or destroy demons) but to be inept, stupid, lazy, self-centered, monopolizing morons. By doing that, they make pathetic loser good guys (I use the term loosely) look much more heroic than they are. What I fail to understand though, is that both of the series in question have terrible plots, childish antagonists, unlikable protagonists, pointless and redundant romance, and no sense of continuity, yet they are both widely loved. I DON'T GET IT! !